To learn more about Dubrovnik’s history and graceful architecture, see its UNESCO World Heritage Listing or the Croatian National Tourist Board’s Dubrovnik overview. 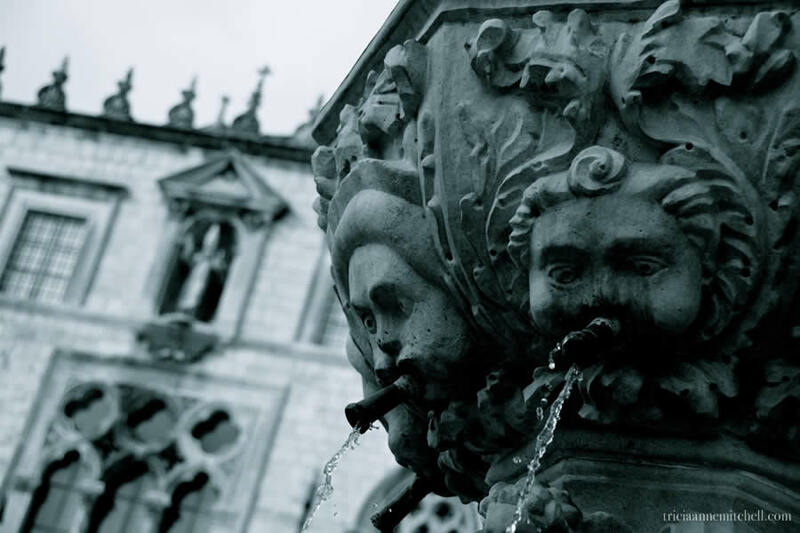 The Great Onofrio Fountain, which is just inside Dubrovnik’s Pile Gate. 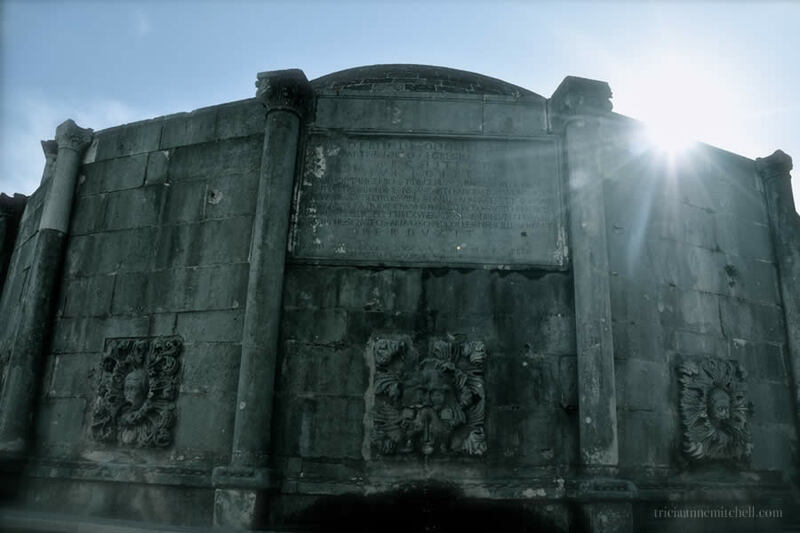 The fountain was built in 1438 to commemorate the completion of the city’s waterworks project. Detail of the Great Onofrio Fountain, which is comprised of 16 sides. 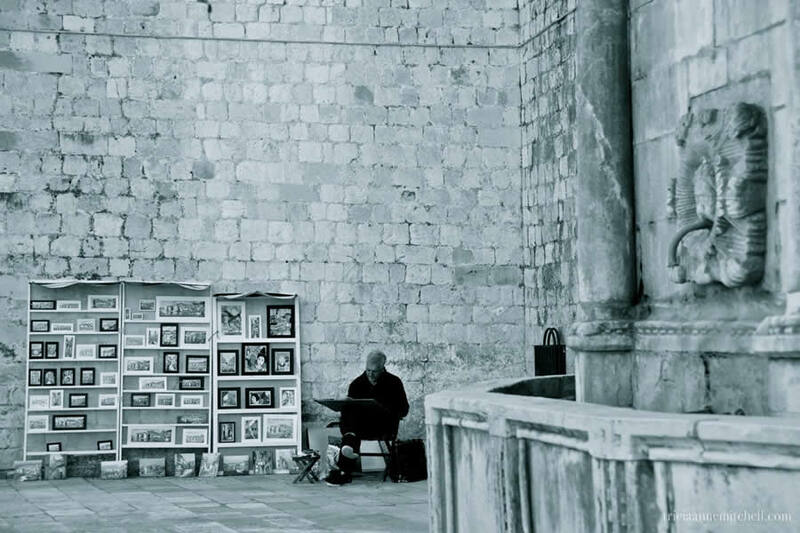 An artist sells his paintings near the Great Onofrio Fountain. 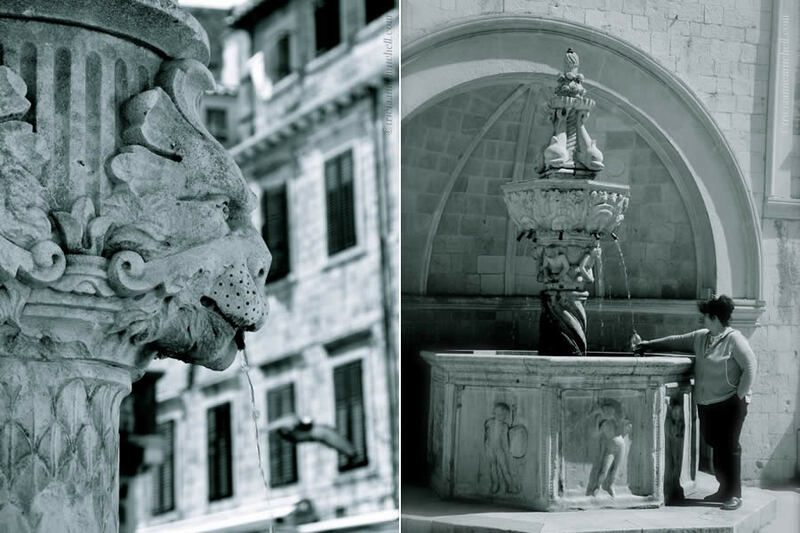 A lion fountain on Gundulic Square. Water trickles from a corner fountain on Gundulic Square. On the right, a woman fills a bottle at the Small Onofrio Fountain. Greetings Jo & thank you! Isn’t it cool how B&W changes the mood of an image? Actually, we’re still in Croatia. (We can’t re-enter Schengen for at least a few more weeks, and we’re loving spending time in Split, though it has gotten chillier in the past days.) Do you have any trips to Portugal planned for the near future? I can imagine, Jo. :) Krakow is beautiful; I’ve only been there for a short visit, but think it would be great to have local family or friends to show us the hidden spots. Are you hoping to do some touristic things elsewhere in the country, or in Krakow? That’s a fun stage to be in. Don’t get into too much mischief. :) When is the wedding? The weather will probably be quite pleasant by then! Will look forward to hearing your tales, Jo. Hi Suzanne! Somehow black & white/a monochrome treatment seemed like a good way to showcase the timeless nature of the beautiful fountains. We’ve also been enjoying seeing some old footage of the former Yugoslavia. The architecture has mostly remained the same, just the attire has changed. :) Did you visit this part of Europe when you headed to Italy? We thought it’d be fun to ride the ferry across the Adriatic. 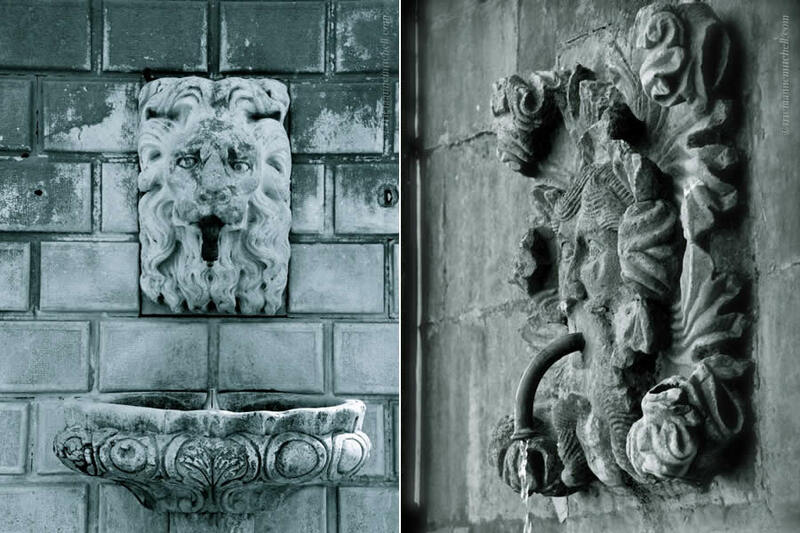 I love these old fountains. Oh the stories they could tell. I always like to think of the thousands of people who have passed by them over the centuries. Their spirits linger. You captured these fountains so well. I vaguely remember more recent earthquakes caused much damage there too. I was fascinated by Dubrovnik and still have very old cine film of a market and of a wrinkled woman buying peppers — not three or four, but a whole bagful. And I can still see the rainbow of colour as the stallholder poured them from the scale pan into a large string bag. I seem to remember a turquoise sea dancing around the old walls, and narrow streets festooned with washing. Amazing what sticks in your mind! Dorothy, you’re correct that there have been more recent earthquakes in the region too. In nearby Herceg Novi, Montenegro, there was a destructive earthquake in 1979. When we visited Herceg Novi last spring, we saw some evidence from that earthquake, most notably a fortress tower which had collapsed into the Bay of Kotor. Don’t want to make you hungry – just thought these dishes might bring back more memories from your time in the region! Wow, what a change, your images are in Black&White, great post, Tricia, as always it was quite educational. Thank you! Cornelia, it is interesting how images converted to black and white can present such a different mood. I appreciated how the monochromatic tones brought out the weathered details of the fountains. Hope your week is off to a wonderful and cheerful start in California! I hear Bavaria was sunny, but very much dressed in snow today. 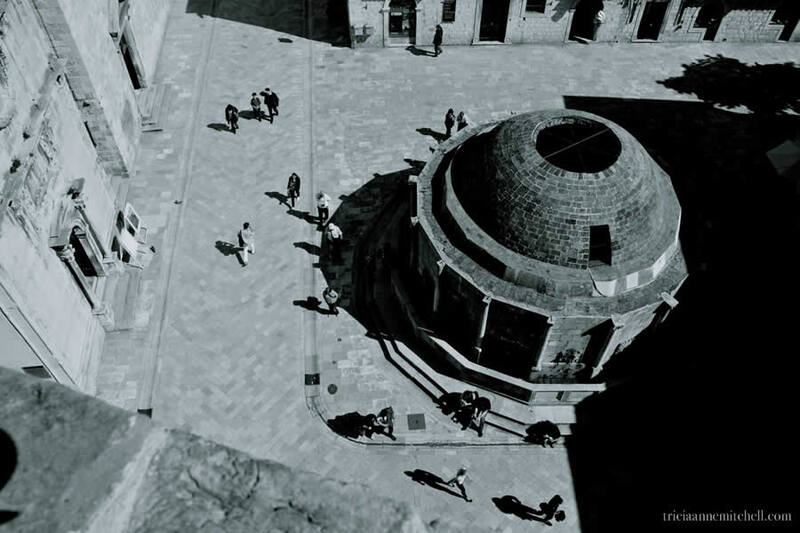 These photographs of Dubrovnik are exquisite Tricia. The ageless beautiful of this city has been captured and speaks of the history of this city. story. Hi Virginia! As they’d say here in Croatia, hvala lijepa – thank you very much – for your gracious words. We’ve enjoyed seeing some vintage footage of Croatia’s lovely seaside towns as they were decades ago. It seems only the fashion of the visitors has changed, with the beautiful backdrops remaining much the same. Thank you, Mark. Dubrovnik is indeed a photogenic city! Did you end up making it to Cyprus over the holidays? Yes Tricia, had 1 day in Israel and 4 in Cyprus, was away for 15 days in total. Sounds like a nice, well-deserved getaway, Mark. Here’s hoping you enjoy the rest of your Sunday! The architecture looks spectacular in Dubrovnik. Since much of it was destroyed, is all this a restoration? Or is this part of what survived the earthquake and war? Bespoke Traveler, sorry for my escargot-paced reply. With computer challenges and being on the road, I’ve been greatly in need of some blog communication catch-up time. :) It’s nice to be back. Your question piqued my curiosity so I did a bit of research. It seems more than half of the Old Town’s buildings were damaged during the 1990s, having been hit by artillery rounds. The city had been designated as a UNESCO World Heritage Site in 1979, so once peace had been restored in the region, it had to be repaired in its original style as per UNESCO guidelines. Even though the buildings looked to be in largely pristine condition to me, we did notice some pockmarks on building’s along the city’s main street, Stradun. Tricia, thanks for looking into this for me! While it is sad that so much of the gorgeous architecture was damaged, your photos show that they are doing quite a feat in the reconstruction. Beyond hearing about how the architecture was restored, it was interesting speaking to the locals who lived in the city during the siege. One hotel owner mentioned staying behind so that he could defend his hometown, whereas his wife and children were able to flee during the fighting. Wow! How incredible that you were able to hear about what the town went through from someone who was there. What did he think about the restoration process? Our conversation didn’t turn to the restoration of the city, but he did mention that his centuries-old home did sustain considerable damage. In fact, I think a mortar damaged one of the hotel’s interior walls. When I was in Bosnia-Herzegovina, almost everyone I met in Mostar or Sarajevo had unfortunate tales to share. Here’s hoping that peace will continue to prevail in this complicated region. Many thanks (even if they are belated!) for your kind words, Abu. 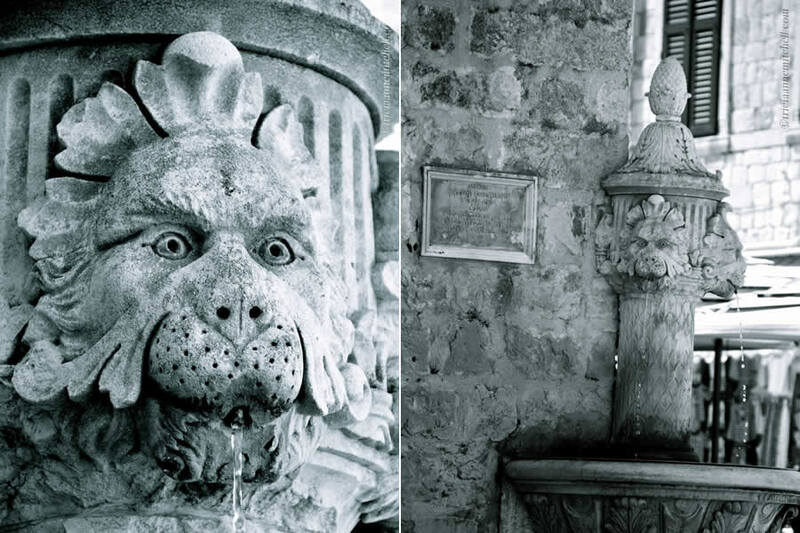 Given the fountains’ centuries-old history, it felt right processing these photographs in a vintage manner. The bird’s eye view shot was taken from Dubrovnik’s old city walls – a great place to capture just some of Dubrovnik’s delightful details. Have you been to Croatia? no I have not. Would love to , some day !